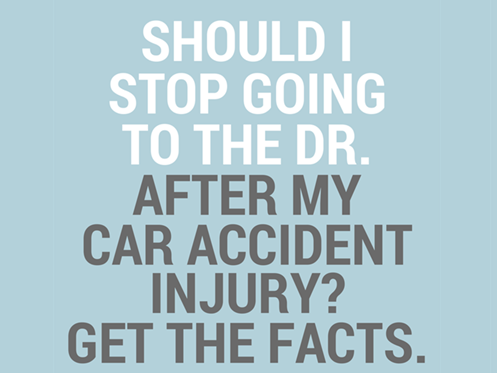 Should I Stop Going to The Doctor After My Car Accident Injury? After a car accident injury is when one should be going to a doctor, so as to document their complaints and initiate timely treatment. Whether the injured person goes to their own doctor (their PCP or perhaps an orthopedist they've seen in the past), as opposed to a doctor that specializes in injury care is another question. The answer probably depends on the injured person’s medical history, their history with their existing providers, and whether or not their existing provider(s) treat accident injuries/patients. Whether or not one has health insurance may play a factor. If a person has pre-existing medical issues of a similar nature (similar to the injuries sustained in the subject accident injury), I think it helps to check in and be evaluated by a medical provider that knew you before the subject accident as they’ll be in the best position to opine as to whether there should be any allocation to your pre-existing conditions. If the injured person was symptom and/or treatment free for a number of years preceding the subject accident, then it probably isn’t necessary to consult with existing medical providers before beginning a course of accident related treatment of one’s choosing.